In this guide we are going to break down the key differences between case managers and social workers. To give you a clear understanding of the two, you will find job descriptions, the major differences and similarities, which key principles they share and the various responsibilities each role holds. What principles do they share? What duties are involved in their roles? Case management is best described as a collaborative process that encompasses various areas of medical care to deliver a personal and tailored recovery plan. It is a broad term that involves so many different duties and responsibilities that it is difficult to define in one sentence. At its core, the biggest challenge is coordinating all the aspects, challenges and activities involved in rehabilitation and making sure the process runs as smoothly as possible. To give you a little more insight into this industry, it has been established in the UK for over 20 years. It continues to grow and develop as the needs of clients evolve. The main aim for social workers is to improve people’s lives by helping them with social and personal issues that they may struggle to cope with on their own. They promote human rights and wellbeing by making sure clients are fully aware of them and that they are being treated fairly in work, school or personal environments. Security is another big issue social workers deal with by making sure those they are working with are in a safe environment and are never put in a dangerous situation. Looking at the bigger picture, their goal is to improve society as a whole by providing support to those who need it and making sure they get the same opportunities. 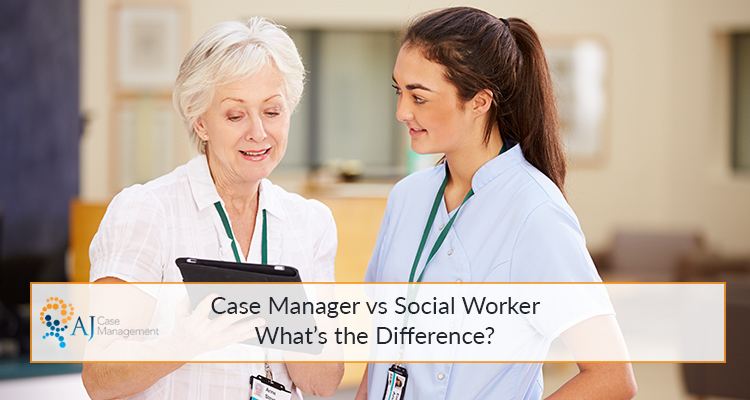 Case manager vs social worker – what are the differences? To those who don’t work in the industry, these two roles may seem very similar. In fact, many confuse the two industries or believe that the terms can be used interchangeably. Education – Case managers may have a degree in nursing, therapy, social work or other relevant fields. However, a social worker must have a specific social work degree to gain a license in the industry. Licensure – Social workers registered with the HCPC can practice in the industry, whereas not all case managers require one. Counselling – Social workers may provide counselling services to those they work with; however, case managers aren’t qualified to do this. Their job is to find the best suited counselling services for the patient and refer them, offering support throughout. Focus – One of the biggest differences is that generally a case managers job is to focus on the injury, rehabilitation and recovery. In social work, they usually don’t deal with injuries and focus more on the personal life of the individual. Medical Treatment – Due to the difference in focus, social workers generally don’t get involved with medical treatment, whereas this plays a big part in a case managers role. What principles do care management and social work share? Whether they are working with an injured patient, a family, a child or any other kind of individual, their main aim is to improve the quality of life through various different methods and strategies. Whether this is through rehabilitation, medication, therapy, counselling or other forms of support, improving the lives of those they work with is at the heart of everything they do. Although the services they deliver to do this may vary, this is a core value that both industries share. Both jobs involve forming close relationships with those they work with. This mainly involves clients, but they may also have close working relationships with families, friends, professionals or other medical staff that may be involved. Working closely with clients and patients is an attractive quality to these two industries and plays a big role into why so many people go into this line of work. There is a lot of satisfaction from working closely with patients and their support network as in these two industries you make a big impact on their lives and get to see their continuous improvements. Constant analysing and performing risk assessments plays a big role in these two sectors. Not only is there the responsibility of making positive improvements, but it is also essential to analyse for possible negative impacts and find appropriate solutions. The context of these risk assessments may vary. For example, a case manager may perform a risk assessment for transferring a patient from one medical facility to another and create plans for any potential dangers or hazards. A social worker might perform a risk assessment for a child visiting a family member and may create solutions for any anxiety, communication barriers or other potential issues. Both roles require high education and continuous training. These industries require many high-level skills that are used frequently in everyday routines. The right education is first required to begin working in both sectors. However, case managers and social workers both share the need for continuous training. As laws change, client needs develop, and social/ environmental factors evolve, these two job roles are constantly growing. The frequency and type of training may differ, but they both require it for successful, productive and safe practice. A person-centred approach coordinates the professional knowledge of medical staff or carers with the personal knowledge of the individuals own body, values, opinions and preferences. It is a concept that is designed to deliver a care plan that is completely tailored and personalised for the individual receiving support. In simple terms, it involves a deeper investigation into the needs and preferences of the person receiving care or support. It is used in both case management and social work to deliver higher quality services. Even with a definition and description of both job roles, we realise that it still may be unclear as to what these professions are involved in day to day. An important value that these two professions share is valuing the importance of setting goals. Whether the patient is going through rehabilitation, recovery, counselling or a form of therapy, setting goals is highly beneficial for the individual and professional. At AJ Case Management we work with clients to understand their short and long term goals so that we can create a plan to achieve them. We know how important reaching milestones is, which is why setting goals is such a big part of the way we work.